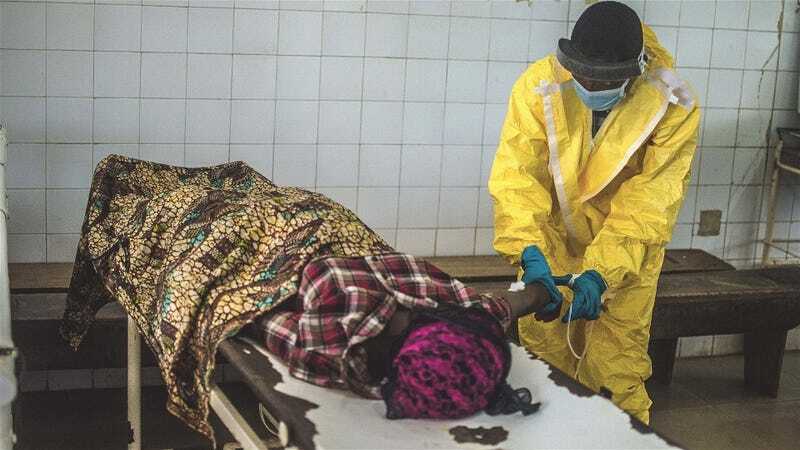 Nigerian authorities have just confirmed a second case of Ebola, prompting the government to announce that it is increasing health screenings at airports to contain the disease. Unfortunately, the likelihood of detecting whether someone is infected is quite small. Fever can be a sign of a lot of different illnesses, not just Ebola. And thermal scanning proved to be a poor method of catching bird flu carriers in 2009 as well. So presenting with an elevated temperature at an airport checkpoint does not indicate clearly enough that the fevered person is carrying the deadly virus. More importantly, the incubation period for Ebola is two days. As many as 20 days can pass before symptoms show up. That means that an individual could be carrying the virus for two weeks or longer and not even know it, much less have it show up via thermal scan. If an individual does appear feverish, then there's the option of a blood test to look for indicators of an infection—notably elevated numbers of antibodies. But the test is expensive and takes eight hours to complete. The logistics and costs of checking the blood of hundreds, perhaps thousands, of passengers makes it an unrealistic option, especially since it would likely bring all air traffic to a halt. Because the population of people who have this illness are relatively small and we have some idea of the areas that have been exposed, Ebola is an example of a threat that could be better managed at airports by picking out those people who were most likely to have encountered the disease based on where they had been. "The nature of Ebola makes it similar to, but also different than traditional aviation threats. Aviation security protects against the flight on hand, while screening for Ebola has a longer footprint to display and protect," Sheldon H. Jacobson, a professor of computer science at the University of Illinois, told Defense One. Pre-screening passengers for Ebola on the basis of where the passenger has been and the likelihood of coming into contact with the disease is probably a more effective means to catch it than is trying to take the temperature of thousands of people with a camera, according to Jacobson. "Prescreening would be prudent, and reasonable, based on the information available. Public health personnel would need to develop appropriate criteria that yield good results and also limit false positives. In essence, prescreening, if done appropriately, can work in any type of screening mechanism," he wrote to Defense One in an email. As always, there is talk about developing better, more effective screening technology. But, for now, Tucker notes, our ability to catch disease at a border hasn't changed much since the Black Death was devastating Europe.